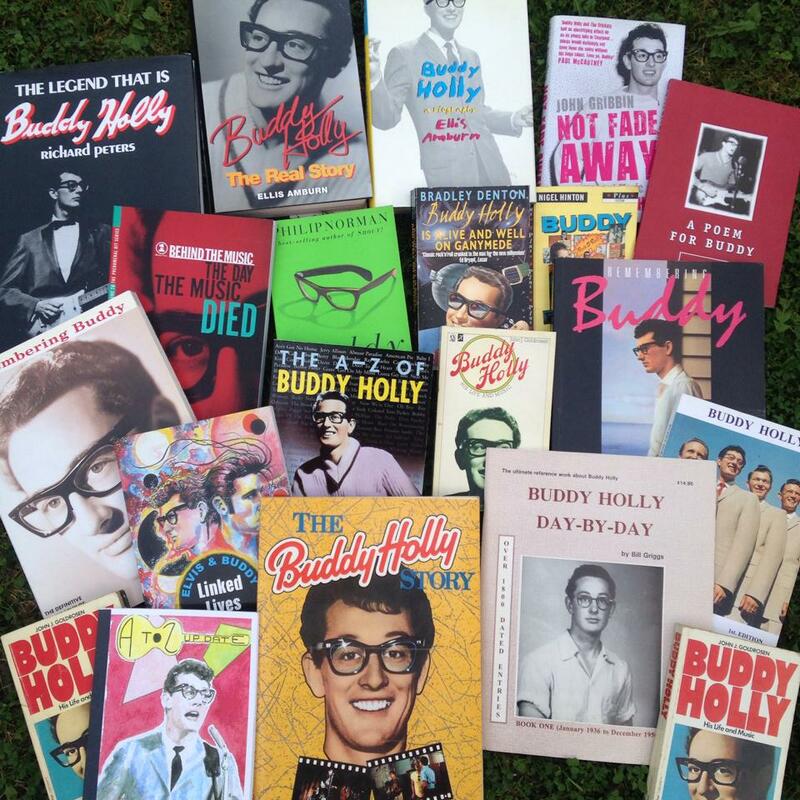 I do like a treat for my birthday, and these days I much prefer an outing or an experience to ‘stuff’. 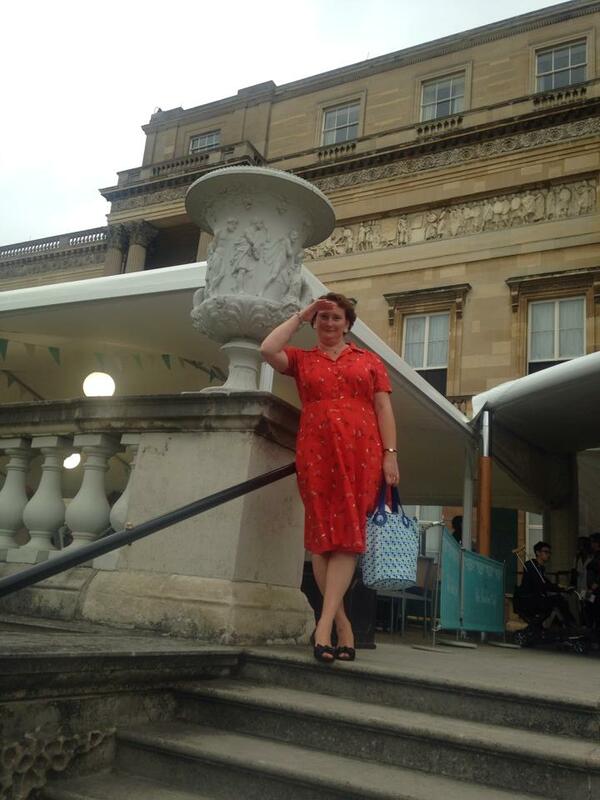 My trip for 2016 was already planned when I saw that the special exhibition for this year’s Summer Opening of the State Rooms at Buckingham Palace was ‘Fashioning a Reign’ – i.e. lots of the Queen’s dresses! 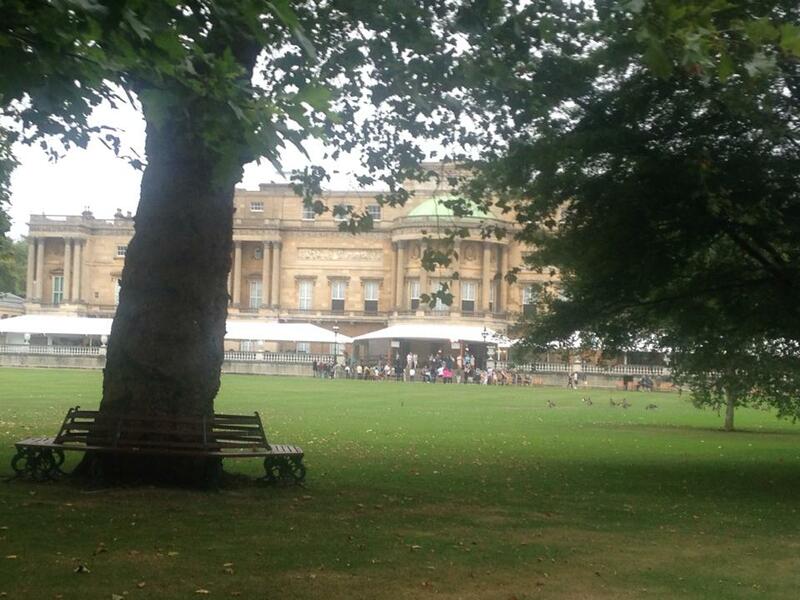 We had seen the ‘Diamonds’ exhibition at the Palace in 2012 and the Coronation collection in 2013, both of which were incredible, on top of getting to see the rest of the rooms that are open to the public and although those 2 visits had taught me that I wouldn’t be getting to try anything on, I knew I would be in for a great experience. 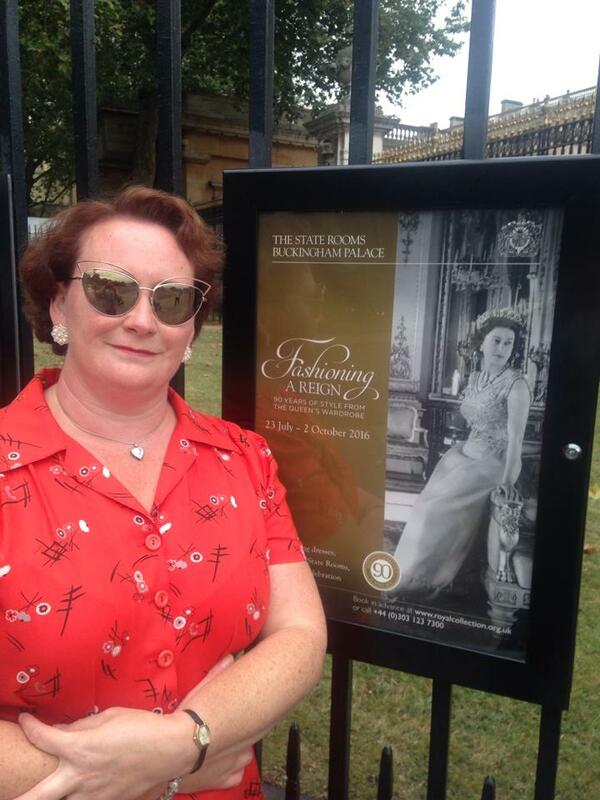 I am a big fan of our Queen, I find everything about her and her reign fascinating, so combined with my love for vintage fashion, this was an outing made in heaven for me! I declined the free audio tour as we both usually find these distracting & we had seen the state rooms before (it was a busy day & featured lots of walking into people stopping abruptly to adjust their sets or see which button to press) but changed my mind once I realised it was an integral part of the fashion exhibit & sent hubby back to get me a player – sorry Simon! First up (after skipping through the other rooms in anticipation) was fashion through the decades from the replica christening robe (the original created in 1841 for Queen Victoria’s oldest daughter) and beautiful little dresses worn by Elizabeth & Margaret for their Father’s Coronation in 1937 right up to date. My own tastes made me favour the beautiful fitted 1940s and 1950s evening gowns from Norman Hartnell, it was interesting to hear other visitors say of the Jackie Kennedy-esque 1960s suits ‘Ooh, you could wear that nowadays…’ and my struggle to fall in love with 1980s & ’90s fashions was helped by photos and moving images of the Queen in the garments – a square shouldered purple 1980s suit looked very unimpressive (to me) on the mannequin, but utterly fabulous on the Queen herself, with hat & shades on an overseas visit. It was interesting, and essential, to bear in mind that the outfits through the decades were of course made for the same person who was naturally aging as each decade passed! I remarked that the 1970s example of a green & white day dress was of a style that could be found in charity shops now, but of course the charity shop find would most likely be St Michael’s in polyester, whereas this was designer silk…..
Also on display, the O.B.E. robe, as featured in the TV Times. Did I mention hats?! There were hats too – a lot of hats!!! The queue after the hats told me that THE dress was coming up & despite staff repeatedly saying ‘there is no queuing system -just come round…’ there really was no other way than to get in line & shuffle along until it was your turn to stand in front of the glass cabinet & gawp at the famous 1947 Hartnell designed wedding dress. Having said that, slightly disappointingly it wasn’t on a mannequin but rather laying flat on a slope & closer inspection (plus a little pre-googling) showed that the dress hadn’t stood the test of time that well, the heavy embroidery had pulled at the silk (I assume why it wasn’t upright) & it showed signs of overall deterioration. Still, it was the Queen’s wedding dress! & I stood my ground until I’d looked as long as I needed to. The shuffling along & standing one’s ground became a feature of the next & final room as there were a LOT of outfits to look at & a LOT of people trying to look at them. 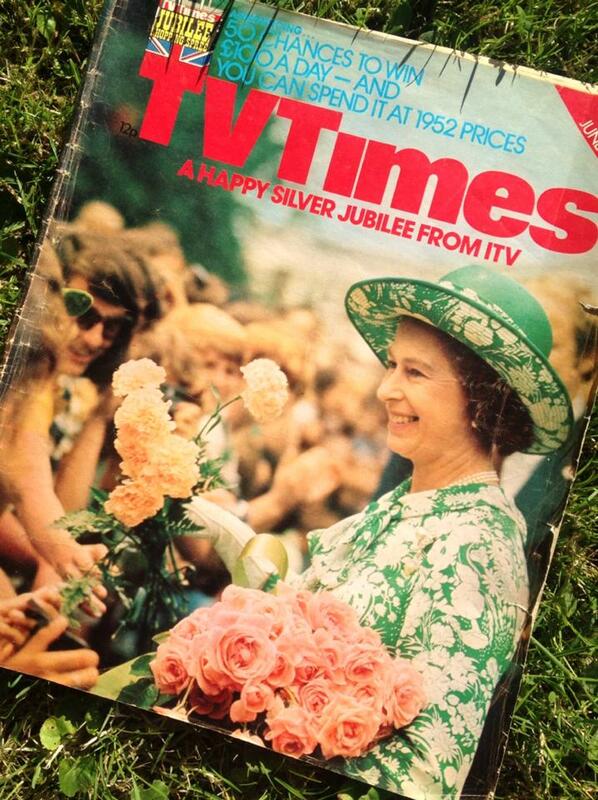 From the official leaflet, & 1977 TV Times. 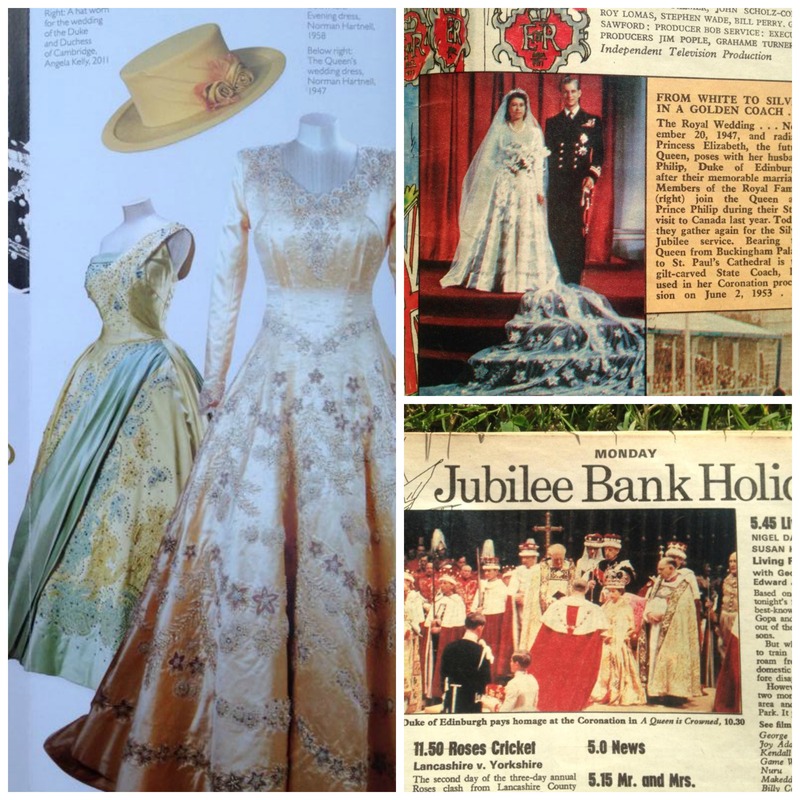 Next came the wonderful Coronation dress from 1953 which unlike it’s 1947 counterpart, looks as crisp, bright & fresh as that special day it was worn. I find the fascinating mix of history and tradition in this garment alongside the fact that it looks unmistakably and irresistibly ‘fifties’ a heady cocktail and as in 2013, I absolutely didn’t want to stop looking at it and even when I’d moved on, I kept turning back to make sure I could still see it and could only concentrate on the rest of the exhibition when it was no longer in my line of vision! It was by no means over after that, the final display room was packed with outfits from those worn at family weddings & occasions, to ensembles created for overseas visits and state occasions, all accompanied by details & explanations. It was interesting to see the trademarks styles of the different designers from Hardy Amies to Ian Thomas and a course a great deal from Norman Hartnell whose gowns are unmistakeable, all beautifully fitted and extravagantly embellished, whether from the ’50s’, ’60s or ’70s. Safe to say I was dazzled by beauty & sparkles by the end! I love a good look around the shop although I was disappointed that there had been no book or brochure produced about the fashion exhibit….good news however, at a film fair in Camden the following day I found a 1977 copy of the TV Times that featured on the cover one of the very dresses we had seen, plus more inside!